iBooks Author, released last month, officially represents Apple’s move into textbooks and offers some really promising features. Apple attracted considerable criticism for iBooks Author’s strict EULA and for its lack of support for EPUB standards. I am not interested in those debates—they certainly have merit and raise issues that should be discussed—but rather interested in how I can leverage iBooks Author and ebooks in general for teaching and outreach. 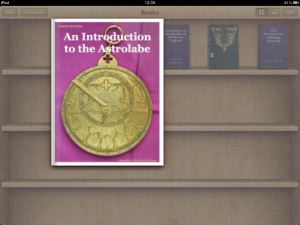 “An Introduction to the Astrolabe” opening on an iPad. This post reflects my use of iBooks Author to produce a short ebook, what I will call an ePamphlet. The content came from courses I teach here at Haverford College. I wanted to see how easy it was to create an ePamphlet, how nice it looked, and how easily I could export it to a PDF. The goal was to think about how easy I could produce material that I could use in courses and, ideally, that I could disseminate to a broader audience of both other educators and an interested public. 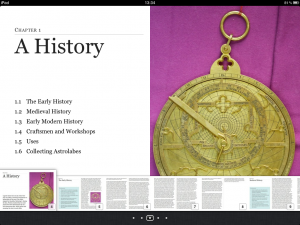 For this test I used material I teach on the history of the astrolabe. I typically spend a week or two on astrolabes in my Introduction to the History of Science class (see recent courses for a description). Astrolabes allow me to get students to think about a number of issues, including technology, craft knowledge, aesthetics, use and tacit knowledge, display, theoretical knowledge, artifacts, collecting, the place of science in society, and timekeeping. I always feel like I don’t quite do justice to these issues because I spend considerable time explaining the general history of the astrolabe. An ePamphlet could cover this history and related topics and would allow me to focus on some of the other issues. At the same time, an ePamphlet would allow me to include nice illustrations (photographs in this case), to update it easily, and to distribute it using fewer resources than a paper handout. Navigating through the text is incredibly convenient on an iPad. 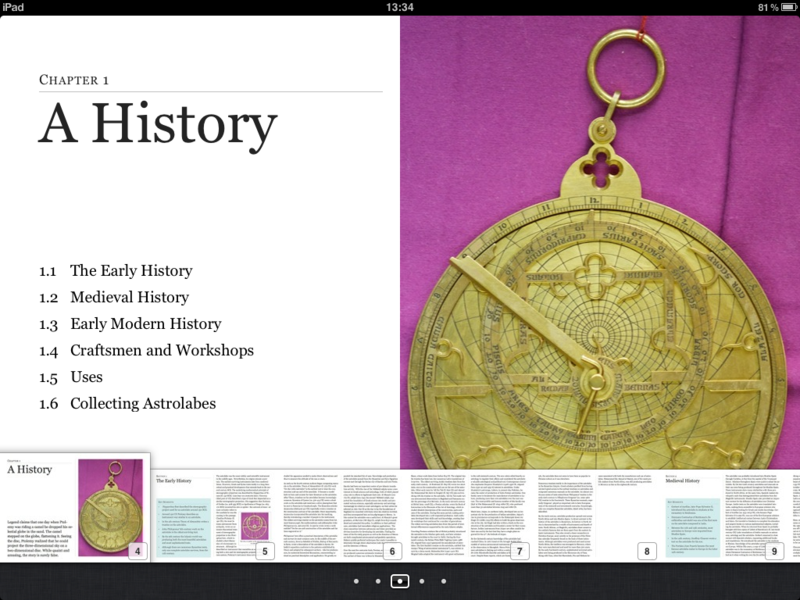 I have to confess that iBooks Author worked wonderfully for converting my material into an ebook. It was easy. It was fast. I produced both an .ibooks and a PDF version (though I wish the PDF didn’t have “iBooks Author” emblazoned across the bottom). I posted the initial version and then a couple days later revised it and uploaded the new copy. It also allowed me to reach a much larger audience with this text. I posted it here and at the PACHS site. In just three days it has been downloaded more than 700 times. 700 times! To be sure, iBooks Author is not perfect. For me, the biggest problem is the requirement that material distributed through the iTunes book store requires an ISBN. These not only cost money, by adding steps to the process, they are an impediment to distributing content-rich material. Perhaps there is a way that Apple could change this requirement for materials that are distributed free of charge. It would be nice if iBooks Author exported EPUB standard material, but I can use a text editor or Scrivener or Pages for that. 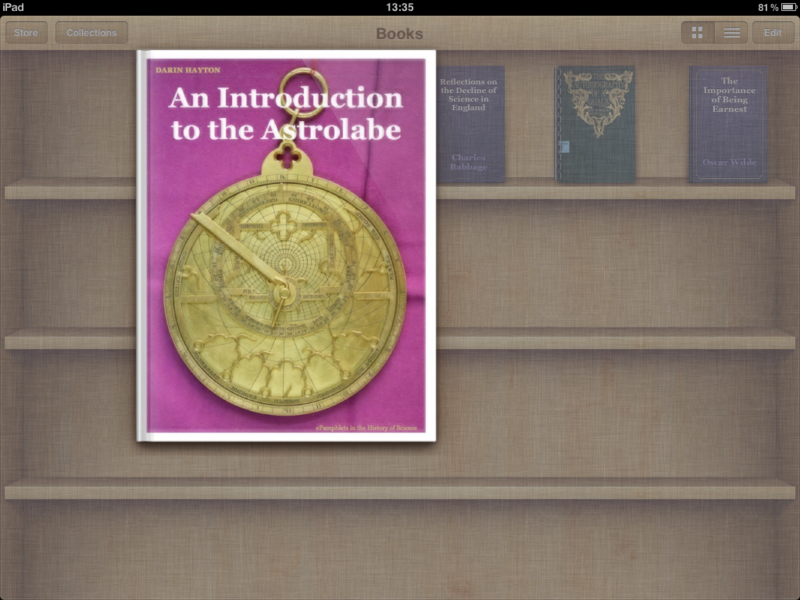 I look forward to future iterations of iBooks Author and other tools for creating ebooks. Apple has shown what is possible. Now it’s time other software publishers step up and produce equally easy-to-use tools.